Young Hannah entered a remedial school in Grade 1 and started attending their weekly occupational therapy, speech therapy and remedial therapy sessions. Before long, she was diagnosed as severely dyslexic. While there are other causes, research has shown consistently that deficits in visual perception and visual memory may cause or contribute to dyslexia. Visual perception refers to the ability to make sense of information taken in through the eyes. This is different from problems involving sight or sharpness of vision. Difficulties with visual perception affect how visual information is interpreted or processed. A child with visual perceptual problems may have 20/20 vision but may have perceptual difficulties. Hannah suffered from deficits in both. Despite all the help afforded at her remedial school and notwithstanding trialling many other products and programs, Hannah’s visual perceptual and visual memory skills were still “below average” by the end of her Grade 5 year. See Hannah’s occupational therapy progress report, dated November 2015, below. Hannah’s mom enrolled her at Edublox in March 2016. Edublox aims at addressing the underlying shortcomings that interfere with academic performance. Underlying shortcomings include visual perception and visual memory. The assessment below is Hannah’s occupational therapy progress report dated November 2016, nine months after starting at Edublox. While her sensory motor functions and learning skills have improved according to the progress report (they were already “satisfactory” in November 2015), her “below average” visual perceptual and visual memory skills have improved drastically. Visual discrimination: No improvement noted. Below is Hannah’s progress, as evaluated by Dr. Lombard, an educational and remedial practitioner, who has assessed Hannah biennially since 2011. This test consists of six subtests. Scoring 0-3 for a subtest is considered to be “below average”, 4-6 “average” and 7-10 “high average”. After joining Edublox Hannah scored “high average” for every subtest. This test consists of nine elementary figures that the learner has to copy. The protocol is scored in terms of mistakes that the learner makes, for example rounding an angle or making a circle instead of a dot. 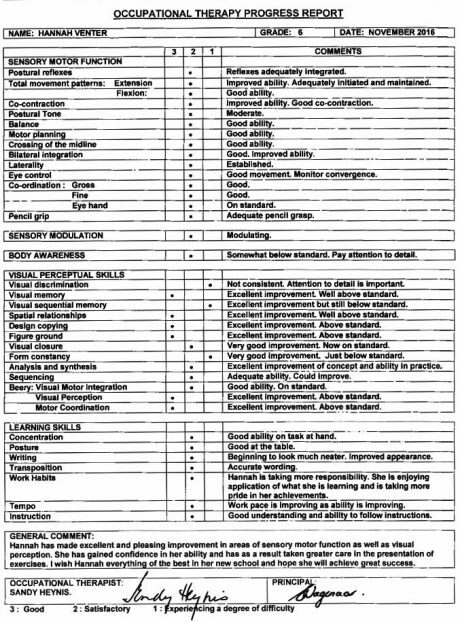 The score gives an indication of the visual-motor maturity of the learner. Laterality entails the establishment of a dominant side of the brain – i.e. the grade of superiority of one side of the body above the other side related to sensory input as well as motor ability. Receptive language is the learner’s ability to comprehend or understand language. Hannah was required to listen to sentences varying in length and complexity.